In the world of body modification, strange body piercings are the norm rather than the exception. Read on to explore some of the most extreme piercings people are getting. Strange Body Piercings: What Wouldn't You Pierce? Some people have to gather their courage just to sit still for a simple ear piercing. To others, an ear piercing is just a stepping stone to greater piercing glory. In the many years since ear piercing became common place in contemporary society, body modification enthusiasts have been pushing the envelope further and further. These days, piercing your ears is blasé. It's the strange body piercings that are grabbing all of the attention. Sure, you can pierce your lips, your nose and even your eyebrows. These are all just a bit more daring than stopping at your lobes, but they still aren't the strangest places to wear a hoop, stud or barbell. Not even a standard tongue piercing falls into this category. 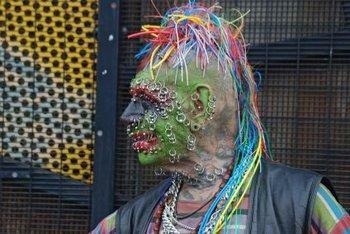 If you're ready to check out some of the most bizarre body piercings of all, read on. They say a picture is worth a thousand words, so there is no better way to address the topic of strange body piercings than by providing images. The image links below lead to Strange Persons.com, a website with a large gallery of bizarre body modifications. A word of warning; don't click on any of the highlighted links if you're easily disturbed. Some of these piercings are very bold, and by their very nature they are designed to shock. As previously mentioned, facial piercings are rather commonplace these days, yet multiplying and otherwise modifying them can give the piercings a totally different presentation. Since they are highly visible, these modifications carry a greater shock factor. Studded face: This collection of facial studs/barbells combined with forehead implants adds up to a slightly sinister look. Head spikes: The subject's unusual nose bridge piercings carry a lot of visual impact, but it's the set of Stegosaurus head spikes that really qualify this as a strange piercing modification. Cheek piercing: Sometimes an original piercing can be stretched and enlarged with the use of increasingly larger hoops. Combined with this young man's collection of nose and eyebrow piercings, his cheek and earlobe plugs totally transform his face. Hoops galore: The subject of this image has also enlarged the piercings in his chin and lobes. Corset piercing: Queen Victoria's corset never looked like this! A series of piercings are laid out in a corset pattern on the back, and hoops are inserted, threaded with lace and tied at the bottom just like a corset garment. Serial arm piercing: One can only imagine the amount of time it takes to create hundreds of arm piercings. Combined with the collar studs, the young man in this image will soon look like he's wearing full body armor if he continues the design. Stud knuckles: Hand piercings aren't something you see every day. These knuckle studs are really more like implants, yet they still must pierce the skin. Freddy Kruegers: The young man in this image has some interesting facial studs, but it's the eight-inch claw spikes running between his knuckles that rank this as a bizarre piercing. When piercing off the beaten path, it's possible to run into complications. The position of some of the stranger body piercings are in areas filled with blood vessels and adjacent to nerve bundles that must be avoided. Others are placed through upper layers of skin with little to keep them from migrating if the tissue is stressed too much. Improperly/Inadequately trained or inexperienced technicians risk doing a lot of damage when trying to perform exotic piercings they have only seen before.For these reasons, it's more important than ever to make sure the technician performing your piercing truly knows what he or she is doing. Take the time to search out multiple qualified technicians, and then find out all you can about their track records. Personal referrals from previous clients are often the best way to find out if a piercer really does a safe and competent job. This way you can avoid physical damage and wind up with a piercing that stays where you want it and does whatever you hope it will do for you. The catalog of strange piercings is virtually limitless, but the information above gives you an idea of the possibilities. Beauty really is in the eye of the beholder, and admittedly these bizarre body piercings aren't for everyone. However, the people who have them are truly exploring the outer limits of self-expression and creativity. Power to them.